Sen. Jeff Flake of Arizona, who has long been one of President Donald Trump loudest Republican critics, is begging Trump not to fire special counsel Robert Mueller, the man leading the investigation of Russian meddling in the 2016 US election. 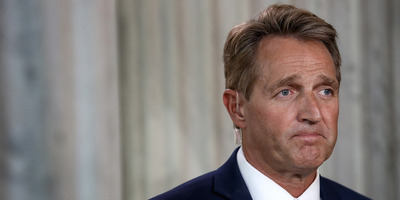 Flake argued that, by firing Mueller, Trump would prompt a constitutional crisis that could only be resolved through impeachment. “No one wants that outcome, Mr. President, please don’t go there,” Flake said on Tuesday. The Republican senator’s comments follow those of his colleague, Lindsey Graham of South Carolina, who suggested in interviews on Sunday and Tuesday that firing Mueller would only make things worse for Trump. Sen. Jeff Flake of Arizona is begging President Donald Trump not to fire special counsel Robert Mueller, the man leading the investigation of Russian meddling in the US election. Flake is one of Trump’s loudest Republican critics and has repeatedly clashed with Trump through the 2016 presidential campaign and into Trump’s first term term in office. Flake said in a tweet on Tuesday, “We are begging the president not to fire the special counsel. Don’t create a constitutional crisis. Congress cannot preempt such a firing,” Flake said. “Our only constitutional remedy is after the fact, through impeachment. No one wants that outcome. Mr. President, please don’t go there,” he added. Flake followed his Republican colleague Sen. Lindsey Graham, who also urged Trump not to fire Mueller during a radio interview with Hugh Hewitt earlier Tuesday. Republicans have been sounding alarms about Trump’s latest tirades against the Russia investigation which took an increasingly aggressive tone over the weekend, with Trump calling out Mueller by name for the first time after his defence attorney, John Dowd, did the same one day earlier. Flake, who had faced a tough reelection bid in Arizona due in part to his ongoing feud with the president, announced in October that he would retire after his term ends this year.